After a disastrous New Year's Eve party, Tim Lake's father had Tim sit down with him at the age of 21 to have a serious talk with him. That talk change Tim's life forever. He had been informed that all the male in the family have a gift of traveling back through time. But can only travel back through times that the person himself has been through and therefore cannot alter history like killing Hitler and the likes. Tim was very skeptical on what his father had told him and so he decided to try it out. In order to travel back in time, he has to go into a dark place, shut his eyes and clench his fists and concentrate back to the moment he wants to travel to. Tim went into the closet and picture back to the New Year's Eve party. When he opened his eyes, he was shocked that he's wearing back the clothes when it was New Year's Eve and heard muffled music playing from the closet. Amazed at being able to travel back to the New Year's Eve party, he then decided to take certain steps to right the wrongs during the party to make it better. After this gift that he discovered, he decided to use it for the one thing he really wanted - and that is to find his true love. During the summer, his sister's friend, Charlotte stayed over for the whole summer and Tim finds himself attracted to her. On the last day, Tim decided to give it a go in asking Charlotte to be his girlfriend but was shot down saying that he should've asked her earlier and not on the last day. So Tim decided to use his gift in doing so but no matter how he tried, he discovered that there was no way to make Charlotte love him no matter what he do. Gaining this epiphany, he decided to venture out from his home and proceed to London to pursue finding true love since he has more chances of meeting women in the big city. Although a luckless start with him working in a lawyer firm, one day, his dodgy friend invited him to join him to go for a dining in the dark experience. Over at the restaurant, Tim had a wonderful time with a girl that he was seated with named Mary. And they both connected and hit it off in the dark. After the dinner, Tim met Mary outside of the restaurant and finds her attractive and was happy that he had finally met someone that he can be with. But when he got home, his uncle whom he's staying with who is a playwriter had a disastrous opening night where one of his lead actor had forgotten his lines and just stood there for a long time turning the play into a horrendous one. Tim decided to help his uncle out and decided to travel back in time and go to the play with his uncle to remind the lead actor his lines. After doing so, he found out that he had lost the moment of meeting Mary and was devastated. He tries desperately to find leads in meeting Mary again and using his ability to help him do so. How does he accomplish that? Watch the movie to find out! 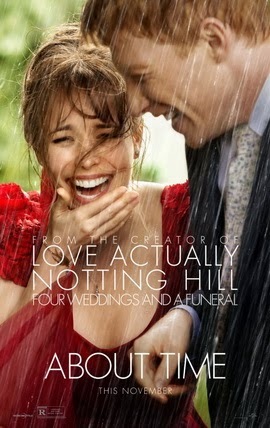 Although the trailer and the movie poster gives out the impression that this is a romantic comedy movie and I was preparing for a lovey, dovey, soppy love story, yet the director Richard Curtis surprised me that the love story was merely the beginning of the plot. The big picture speaks of appreciating life and cherishing moments with loved ones as much as they can. It also succeeds in evoking laughter in it's audience with witty remarks and hilarious moments. I truly like this movie a lot and when it ended, I had this longing in me to watch it again once more with its beautiful poetic way of conveying the plot in such a way. It's been awhile since a movie stirs up my urge to watch again immediately after it ended.